On March 9th at 6:00pm, join the Wichita Grand Opera and our Ball Co-Chairs Dr. Thomas & Lily Ashcom and Kenneth & Susie Doonan, as we take a trip to España! 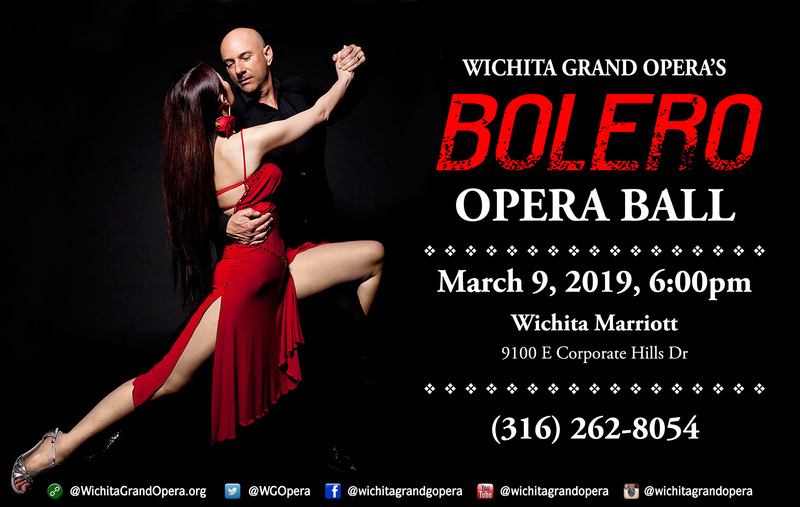 Experience the Tango, the Paso Doble, and even the Bolero itself, as we toast the town with our Annual Opera Ball at the Wichita Marriott. With an opulently appointed evening of fine dining, Spanish dancing, great entertainment, and luxury Live and Silent Auctions, THE ONLY Social Event or Opera Ball of its kind in the state of Kansas is sure to exceed your wildest dreams. The evening will be one to remember, so dance as your favorite matador, don your finest dress and join Wichita’s greatest movers and shakers in the aviation, construction, medical, legal, and entrepreneurship fields as you meet old friends and greet new ones, but don’t forget your dancing shoes as you step out onto the dance floor, and prepare to see and be seen. Here is a list of the luxury Live and Silent items we have up for grams at the Bolero Opera Ball on March 9th. We expect additional items to be added until the time of the ball, so stay tuned! Be a Sponsor for the BOLERO Opera Ball on March 9th. For more information, contact the WGO at (316) 683-3444 or by clicking HERE! Reservations for the BOLERO Opera Ball are $200.00 per person or $1,500.00 for a table of TEN. (a portion of which is tax-deductible). To make your reservation, you can: Contact the Wichita Grand Opera Box Office at (316) 262-8054, or purchase online by clicking below.